The 2019 Convention will be held June 2-5 at The Main by Hilton in downtown Norfolk, VA. The host hotel is located centrally in downtown Norfolk, within walking distance of a diverse offering of entertainment including the new Waterside District, Harbor Park, Town Point Park, Nauticus, and an abundance of downtown shopping and restaurants. The Main is only blocks away from the USCAA's headquarters in the Town Point Center Building, where we will unveil the third class of the USCAA Hall of Fame Class in 2019. 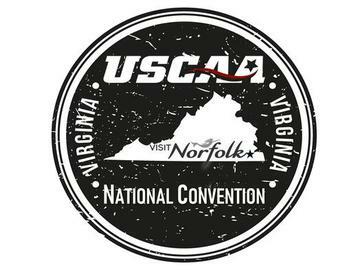 The USCAA Convention is an annual meeting of USCAA Athletic Directors, administrators, and coaches (*guests welcome at most events). The event includes Town Hall sessions on championships, ratings/selections and bylaws, business meetings, as well as professional development and social opportunities. *Guests incur an additonal charge for meals. No registration fee for guests not attending meetings.